Signatrol, the Tewkesbury (UK) based manufacturer of the SpyDaq wireless temperature and humidity data logging system, has been awarded a UK patent for some of the communications aspects of SpYdaq, that make their system reliable, yet simple and cost efficient for pharma and food industry monitoring. Initially designed to monitor and record temperature and humidity in buildings and storage areas, SpYdaq enables easy compliance with HACCP, EN12830, FDA CFR21 Part 11 and other relevant standards – where careful inviolate monitoring of storage conditions is required for quality reasons and to comply with legislation. Unlike other similar systems on the market, SpYdaq features a unique high redundancy data package, specifically designed by Signatrol and it is this that has been recognized by the Patents Office and the award of UK Patent number 2479520. SpYdaq monitors key parameters and transmits them, via a licence-free radio band, to a base station which then makes the data available via bespoke display and analysis software, using either an Intranet or the Internet. Using sensors linked by radio means that installation is quick and easy. The transmitters ‘sleep’ and then wake up at defined intervals to transmit the data. Using this method means that the transmitters are purely transmitters and not transceivers, thus reducing the cost and complexity of the system. A potential problem would arise with this approach when two or more transmitters try to transmit at the same time, and signals collide, resulting in loss of data. Signatrol has developed its unique communication system to ensure that in the event of a collision no data will be lost. In fact, for a fully populated system, the likelihood of losing a single reading is once in every 67 years. Indeed the Signatrol website quotes many well known names in the pharmaceutical and food industries as their customers: these are the major targets for Signatrol. Included are the NHS, AstraZeneca, Pfizer, GSK, and in foods Cadbury, Kellogg’s, Premier Foods and British Sugar. The base stations can collect data from up to 16 transmitters, which can optionally also receive an external input signal, as well as monitor temperature and humidity. There is no info about the radio system employed, or the operating range, but various base stations offer local or intranet alarm set points, and there is also a unit that transmits data to the Signatrol cloud system for further recording and control actions. The base stations start at around GBP500, and the sensors at GBP130. 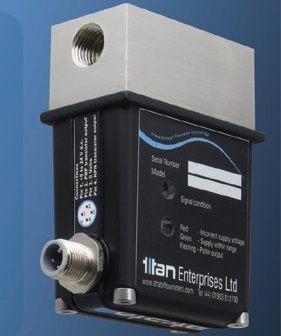 A new flowmeter for small bore liquid flows has been introduced Titan Enterprises, an enterprising British company, who are a long established manufacturer of liquid flowmeter systems. Their first ultrasonic meter was introduced in around 2010, after a long development programme in co-operation with Prof Mike Sanderson at Cranfield University, and was called the Atrato. This unit was launched for the typical markets served by Titan, of laboratory testing, drinks dispensing, cooling systems, pilot plants, fuel cells, pharmaceutical applications and OEMs – and offered a 200:1 turndown, 1% accurate obstructionless straight through meter with a 4-20mA output. Materials were mainly PEEK and borosilicate glass or stainless steel for the flow tube, but the BSP or NPT male fittings were available in stainless steel. A very clever and high performance flowmeter for flows up to 20 Litres/min. Regrettably, while having worked with Titan for many years prior to 2010 on their PR and promotion, a high flying expensive agency was brought in to promote the Atrato, so it disappeared off my radar. I should not say much about whether it has been seen by anyone else since then, because I don’t have any info: but why are you reading this? Now a new launch has been announced by Titan, of the Process Atrato flowmeter: a new version of the basic flowmeter, now ‘packaged for the process and control environment’. This unit is built from 316 stainless steel and PEEK, plus an elastomer seal to suit the application, and has the on-board electronics sealed to IP65. From the photo you can see that the threads into the stainless steel process connection (at the top of the flowmeter) are female. The lower screw thread is for an M12 four pin electrical connector. The unit is suitable for 65 Celcius and 25 bar process conditions: the non-process Atrato can operate up to 110C if the electronics is installed remotely, so presumably this might be a future development. Flow range covered is 2mL/min to 15 Litres/min, using four flowtube sizes. Each of the four models covering the different flow ranges is configured to offer the same pre-set ‘K-factor’, which is quoted to assist OEM use and interchangeability: but it also highlights that the electronic output available on these “process units” is a PNP and an alternative NPN pulse train, quoted as a ‘frequency’ output. Presumably this relates back to the pulse output style as was provided by the other Titan turbine and positive displacement flowmeter sensors. A separate power supply, from 8-24VDC, is used to power the unit. The other surprise for me was that the meter is pictured, and obviously intended for installation, ‘upside down’, with the electrical connections and housing below the flow line. When this Process Atrato is really an equivalent to a thermal mass style gas flowmeter application, but on liquids, you would think it would be sensible to have it looking similar to these other, well-known gas flow devices. The reason for this cannot be that it needs to allow entrained air to escape, as the flow tube is just a straight tube, with no complicated connections which might trap anything. For the engineers who can see through these confusion factors, the device is a very effective flowmeter, 200:1 turndown, +/-1% accuracy over 2-100% of range, while working with viscous as well as non-viscous fluids – with the standard Atrato features of linearity, no moving parts and fast response time. Plus the PR says it will offer a ‘reduced cost of ownership’, but does not specify what this is compared with…..surely the point is that there is not much else on offer to provide this performance, except maybe a micro-Coriolis meter. The pity is, ever since launching the Bestobell Doppler flowmeter in 1976, and the Platon Kat in 1998, I’ve been looking forward to being involved in the launch a decent ultrasonic flowmeter for clean liquid process applications…..